Not to be confused with John Bell (Tennessee politician). John Bell Hood (June 1 or June 29, 1831 – August 30, 1879) was a Confederate general during the American Civil War. Hood had a reputation for bravery and aggressiveness that sometimes bordered on recklessness. Arguably one of the best brigade and division commanders in the CSA, Hood gradually became increasingly ineffective as he was promoted to lead larger, independent commands late in the war; his career and reputation were marred by his decisive defeats leading an army in the Atlanta Campaign and the Franklin–Nashville Campaign. Hood was commissioned a brevet second lieutenant in the 4th U.S. Infantry, served at Fort Jones, California, and later transferred to the 2nd U.S. Cavalry in Texas, where he was commanded by Col. Albert Sidney Johnston and Lt. Col. Robert E. Lee. While commanding a reconnaissance patrol from Fort Mason on July 20, 1857, Hood sustained the first of many wounds that marked his lifetime in military service— an arrow through his left hand during action against the Comanches at Devil's River, Texas. He was later promoted to first lieutenant in August 1858. Hood resigned from the United States Army immediately after the Battle of Fort Sumter and, dissatisfied with the neutrality of his native Kentucky, decided to serve his adopted state of Texas. He joined the Confederate army as a cavalry captain, then was promoted to major and sent to command Brigadier General John B. Magruder's cavalry in the lower Virginia Peninsula. Hood and his horsemen took part in a "brilliant" July 12 skirmish at Newport News, capturing 12 men of the 7th New York Regiment of Volunteers as well as two deserters from Fort Monroe. They received high praise from Generals Lee and Magruder. By September 30, the Texan was promoted to be colonel of the 4th Texas Infantry. When Maj. Gen. William H.C. Whiting left the army on medical furlough July 26, Hood became permanent division commander, and his command was reassigned to Maj. Gen James Longstreet's corps. While the division had numbered five brigades at Seven Pines, a couple of army reorganizations since then reduced it to just two—the Texas Brigade and a brigade of Mississippians commanded by Col. Evander M. Law. Also accompanying them during the Northern Virginia Campaign was the independent South Carolina brigade of Brig. Gen Nathan G. Evans, who technically had authority over Hood, his junior in rank, for the campaign. At Second Bull Run, Hood spearheaded the assault on the Union left flank that forced them to retreat from the field. Hood's two brigades lost over 1000 men in the battle, and if Evans's brigade is also counted in, the total would be near 1500 casualties. It could scarcely be said that any [of the officers in Longstreet's corps] ... save one had by this date displayed qualities that would dispose anyone to expect a career of eminence. The exception was Hood. ... Anyone who had followed the operations of the Army after Gaines's Mill would have said that of all the officers under Longstreet, the most likely to be a great soldier was Hood. I agree with you in believing that our army would be invincible if it could be properly organized and officered. There never were such men in an army before. They will go anywhere and do anything if properly led. When Hood came with his sad Quixote face, the face of an old Crusader, who believed in his cause, his cross, and his crown, we were not prepared for such a man as a beau-ideal of the wild Texans. He is tall, thin, and shy; has blue eyes and light hair; a tawny beard, and a vast amount of it, covering the lower part of his face, the whole appearance that of awkward strength. Some one said that his great reserve of manner he carried only into the society of ladies. 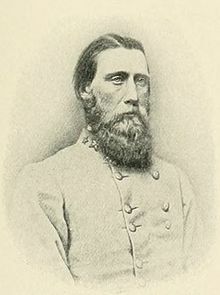 Major [Charles S.] Venable added that he had often heard of the light of battle shining in a man's eyes. He had seen it once — when he carried to Hood orders from Lee, and found in the hottest of the fight that the man was transfigured. The fierce light of Hood's eyes I can never forget. 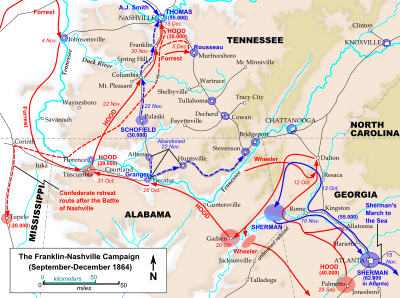 The Army of Tennessee continued withdrawing until it had crossed the last major water barrier before Atlanta, the Chattahoochee River. During this time, Hood had been sending the government in Richmond letters very critical of Johnston's conduct, bypassing official communication channels. The issue came to a head when Gen. Braxton Bragg was ordered by President Davis to travel to Atlanta to personally interview Johnston. After meeting with Johnston, he interviewed Hood and another subordinate, Joseph Wheeler, who told him that they had repeatedly urged Johnston to attack. Hood presented a letter that branded Johnston as being both ineffective and weak-willed. He told Bragg, "I have, General, so often urged that we should force the enemy to give us battle as to almost be regarded reckless by the officers high in rank in this army [meaning Johnston and senior corps commander William J. Hardee], since their views have been so directly opposite." Johnston's biographer, Craig L. Symonds, judges that Hood's letter "stepped over the line from unprofessional to outright subversive." Civil War historian Steven E. Woodworth wrote that Hood was "letting his ambition get the better of his honesty" because "the truth was that Hood, more often than Hardee, had counseled Johnston to retreat." However, Hood was not alone in his criticism of Johnston's timidity. 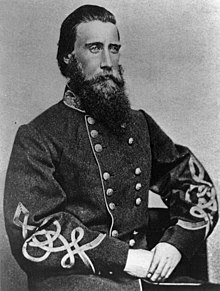 In William Hardee's June 22, 1864, letter to General Bragg, he stated, "If the present system continues we may find ourselves at Atlanta before a serious battle is fought." Other generals in the Army agreed with that assessment. Never had there been such an overwhelming victory during the Civil War—indeed, never in American military history. His insurance business collapsed during a yellow fever epidemic in New Orleans during the winter of 1878–79. Soon after, in a single week, the epidemic killed Hood himself, Hood's wife, and his eldest daughter Lydia. His other ten children were left orphaned and penniless. The Texas Brigade Association provide support for the children for more than 20 years and all ten were eventually adopted by seven different families in Louisiana, Mississippi, Georgia, Kentucky, and New York. Hood County in Texas was named after him. ^ Eicher, p. 302. Bonds, p. 77, stated that there was no contemporary evidence that Hood was called "Old Woodenhead". It appears to have been an invention by some historians (such as by Edward A. Pollard, who in the Life of Jefferson Davis, referred to Hood as having "a lion's heart and a wooden head"). Woodworth, p. 271, states that after Hood's leg amputation at Chickamauga, his soldiers called him "Old Pegleg." ^ Eicher, p. 302; Warner, p. 142; Handbook of Texas Online. ^ Jones, p. 213; McMurry, p. 5; About North Georgia website; JohnBellHood.org website. June 29 is the date given on his tombstone and therefore seems the more likely..
^ McMurry, pp. 2, 205. In his memoirs, Hood claimed to be of English descent on both sides of his family. In fact, the earliest record of his family is the 1696 marriage of Jasper Hood and Tryntje Andries, recorded at the Dutch Reformed Church of New York City. ^ Eicher, p. 302; McMurry, p. 6. McMurry, p. 10, lists Smith as a "distant relative." ^ McMurry, p. 9. McMurry reports that Hood's four-year total of 374 demerits was "above average". ^ Eicher, p. 302; Handbook of Texas Online. ^ a b c Eicher, p. 303. ^ McMurry, p. 51, Sears, p. 243. ^ McMurry, pp. 52, 55. ^ Freeman, vol. 2, p. 273. ^ McMurry, pp. 58-59; Eicher, p. 303. ^ McMurry, pp. 65–66, 69–71; John Bell Hood, p. 52; Dyer, p. 177. ^ John Bell Hood, p. 52-3; McMurry, p. 71. ^ Pfanz, pp. 164-73; McMurry, p. 75. ^ John Bell Hood, p. 62; Chesnut, p. 289. ^ Cozzens, Peter (1992). This Terrible Sound: The Battle of Chickamauga. Champaign, Illinois: Urbana: University of Illinois Press. pp. 119–20. ISBN 9780252017032. ^ Woodworth, pp. 268–69; McMurry, pp. 80–83, 86–92. ^ Woodworth, p. 271; McMurry, p. 83; Castel, p. 62. ^ McMurry, pp. 111–12; Robins, Glenn (2006), The Bishop of the Old South: The Ministry And Civil War Legacy of Leonidas Polk, pp. 188–81. ^ Woodworth, p. 276; Castel, pp. 195–201; Symonds, pp. 292–93. ^ Symonds, pp. 321–24; Woodworth, p. 284. ^ Stephen M. Hood, pp. 23–4. ^ Sword, p. 32; Bonds, p. 68; Woodworth, pp. 284-85. There are some popular accounts that quote Lee as saying Hood was "too much of a lion and not enough of a fox," but there is no documentary evidence of this quotation. Stephen M. Hood, pp. 14–16, attributes this mistaken quotation to a verse in the poem Army of Northern Virginia by Stephen Vincent Benét. ^ Stephen M. Hood, p. 13. ^ Dyer, p. 261; John Bell Hood, p. 182. ^ Horan, Pat. "Sherman Unleashes Total War on Confederacy". Real Clear History. Archived from the original on 2 April 2015. Retrieved 28 March 2015. ^ Sword, pp. 46–49; Jacobson, pp. 30–32. ^ Jacobson, pp. 239–40. For an example of a view promoting Hood's anger and resentment, see Sword, p. 179. For modern scholarship that calls Sword's (and others') work into question see, generally, Stephen Hood, John Bell Hood: The Rise, Fall, and Resurrection of a Confederate General. ^ a b Sword, p. 425. ^ Woodworth, pp. 301; McMurry, p. 183; Eicher, p. 303. ^ "John B. Hood Junior High Schppl". ectorcountyisd.0rg. Retrieved April 3, 2014. ^ Watkins, p. 225; Stephen M. Hood, p. 42. ^ Bell I. Wiley, The Life of Johnny Reb, the Common Soldier of the Confederacy (Indianapolis: Bobbs-Merrill, 1943), OCLC 444699, pp. 121-22. Wiley sources this claim to Robert Selph Henry, The Story of the Confederacy (Indianapolis: Bobbs-Merrill, 1931), OCLC 1300151, p. 434, but Henry provides no primary source citation. An earlier reference to the song is in William Josiah McMurray, Deering J. Roberts, and Ralph J. Neal, History of the Twentieth Tennessee Regiment Volunteer Infantry, C.S.A. (Nashville, TN: The Publication Committee, 1904) OCLC 4535877, p. 352. However, there it is described as the product of a single soldier singing while Hood passed by, consisting only of the lyrics "You may talk about your dearest maid, and sing of Rosa Lee, but the gallant Hood of Texas, played hell in Tennessee." In Bromfield Lewis Ridley, Battles and Sketches of the Army of Tennessee (Mexico, MO: Missouri Print. & Pub. Co., 1906) OCLC 2014208, p. 439, the anecdote is expanded to be "And now I'm going Southward, for my heart is full of woe. I'm going back to Georgia, to find my 'Uncle Joe'. You may talk about your dearest maid, and sing of Rosalie, but the gallant Hood of Texas, played Hell in Tennessee." Bonds, Russell S. War Like the Thunderbolt: The Battle and Burning of Atlanta. Yardley, PA: Westholme Publishing, 2009. ISBN 978-1-59416-100-1. Dyer, John P. The Gallant Hood. New York: Smithmark, 1995. ISBN 978-0-8317-3285-1. First published 1950 by Bobbs-Merrill. Jones, Wilmer L. Generals in Blue and Gray: Davis's Generals. Mechanicsburg, PA: Stackpole Books, 2006. ISBN 0-275-98324-2. McMurry, Richard M. John Bell Hood and the War for Southern Independence. Lincoln: University of Nebraska Press, 1992. ISBN 0-8032-8191-9. Watkins, Sam, Co. Aytch or, A Side Show of the Big Show and Other Sketches. Plume, 1999. ISBN 0452281245. McMurry, Richard M. "John Bell Hood." In The Confederate General, vol. 3, edited by William C. Davis and Julie Hoffman. Harrisburg, PA: National Historical Society, 1991. ISBN 0-918678-65-X. Wikimedia Commons has media related to John Bell Hood. Entry for General John B. Hood from the Biographical Encyclopedia of Texas[permanent dead link] published 1880, hosted by the Portal to Texas History.